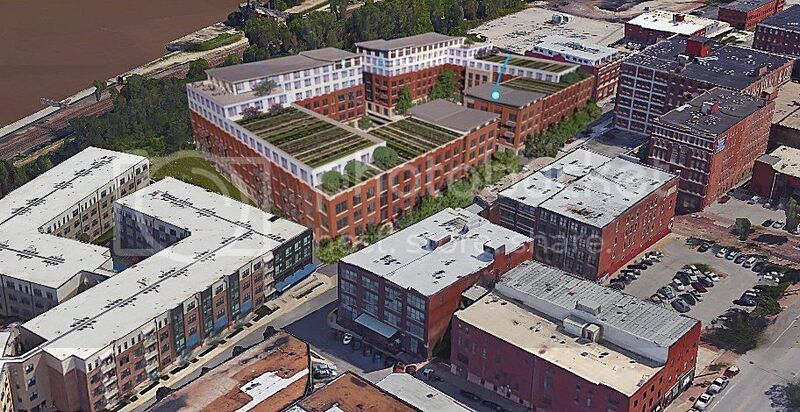 Amid a flood of new and redeveloped apartment construction in the Kansas City area, those things stand out about a $60 million apartment project slated for the Missouri riverfront just north of downtown. Named Second and Delaware, a nod to the nearest intersection, the 276-unit project will bring greener-than-green technology to a large residential building. According to national experts and the development team, its two buildings will comprise the largest U.S. multifamily apartment project using Passive House Institute-certified construction, a system that’s more energy-efficient than the highest LEED (Leadership in Energy and Environmental Design) building standard. believe it or not, there was no existing thread on this project. At first glance this looks like a prison camp but if thinking in context to the rest of the area, it could work well - would be nice to see a rendering with surrounding area. Everything else about it sounds good on paper and brings a new kind of product downtown - and 270+ more units. I have a feeling this will make all the other recent downtown housing projects look pathetic. This may be the antithesis of River Market West. Am I seeing no surface parking for this project? You're both right. This will be one of the best projects downtown has seen in a long time. Eon Blue wrote: You're both right. This will be one of the best projects downtown has seen in a long time. 500 spots in basement parking. Basement parking allows for street level retail and generous parking spots, so I hope to see this a lot more in the future. It fits in well for an edge property in the neighborhood. It is also on a difficult parcel because of the steep grade on Delaware going down to the river. I think the architects did the best job dealing with that. harbinger911 wrote: is this the right spot? The challenging grade is actually what makes it easier to do the basement garage. Arnold’s development group obtained a $2.9 million commitment from the city to finish Second Street west from where it now ends at Delaware Street and help build a half-acre neighborhood park on the west side of the apartments. The developers also will vacate Delaware, which now peters out as it heads down the riverbank toward a nonexistent First Street. This good to see. Glad it will reconnect the grid. Is DE Lofts at 3rd/DE now condo or still rentals? (Bottom right corner of pic above.) Would be nice to see that lot developed with perhaps a deal with 2nd/DE project to use their garage temporarily until developed. Or perhaps developer of 2nd DE buys the DE Lofts building/lot and develops the lot sharing 2DE garage temporarily. Even if a 3 floor garage with streetfront retail for 3rd/DE - much better than a corner surface lot. BTW, '2nd and Delaware' is a rather boring name for building - is that a temp project name? Something like RiverView would be better and even that is pretty generic. OTOH, '2DE' would be a contemp spin. I think your contemporary spin is dated and not contemporary. That building at 3rd and Delaware is Delaware Lofts and has nothing to do with the DE development on 5th and south of 5th. How about Muddy MOLO? Or Muddy SOLO? Ha, yeah, 2DE may now be so last microsecond. As far as 3rd/DE, I know it has nothing to do with this project. Am saying if 2DE developer bought 3DE out to develop that lot, they can use 2DE garage temporarily for DE Loft tenants until garage/whatever built at 3rd/DE. Delaware strip needs to become 'the' community strip for W RM and that corner lot drags down the pedestrian continuity. Last edited by earthling on Tue Sep 08, 2015 9:54 am, edited 1 time in total. DE Lofts is a combination of buildings on/around 5th St. Delaware Lofts is just north of 3rd. They are different completely. That was the point I was trying to make, besides coming up with brilliant names. Perhaps someone else with more knowledge can chime in. Ah, I follow you. Either way, that 3rd/DE lot needs to be developed and wondering if 2DE project can help by offering temp garage space in one form or another. There is much convoluted about the conversation. Delaware Lofts (218 Delaware) does not own the lot at 3rd and Delaware. There are multiple lots, owned by multiple entities, that are shared by all of the apartments collectively. That has been in place for 20+ years. Likely to change, though. It seems the lot you are mentioning at 3rd and Delaware is up for sale by Red Brokerage as part of a $5.6 million dollar offering. I offered them 5.5 and they won't even return my calls. harbinger911 wrote: 3rd Street is another high profile street that suburbanites drive down and it has virtually no street front development, making it look ghetto. Seems like developers don't mind developing the back yard of the Market area while avoiding the riff-raff along the major streets. Ahhh, it couldn't remain a secret. In October of 1997, all the developers in the River Market gathered at a secret meeting at Cafe' Al Dente. At this meeting, the inevitable problem of suburbanites in the neighborhood was discussed in frightening detail. Recognizing that roundabouts and Panera's were magnets for 'these people', it was decided that the neighborhood should take steps to insure that the elites would never feel comfortable in the area and that eliminating finish, polish and excessive refinements from the future hood was necessary to prevent infestation with pink persons. What you see today, is the result of their ingenious plans. Sidewalks are cracked and weedy. Parking lots are tight, heavily signed with towing threats and these lots are distributed to prime corners of 3rd and 5th streets. The smell of urine lurks around every corner. The City Market is filled with and a broad range of brown-skinned peoples....Sudanese, Bangladeshi, Honduran and the like. Parallel parking has been preserved in every possible location (elites can't p-p in public). Pedestrians and bicyclists have been distributed throughout the area with instructions to slowly enter crosswalks when sub's are seen entering the area. Restaurants are alerted to ask haughtily "But, did you make a reservation?! .....upon encountering such tattoo-lacking foreigners entering even empty establishments. Your help is needed though. If in doubt, don't smile, don't say 'howdy', give them wrong directions. It's for the good of the community. Argh - the only thing that Kansas City loves more than its cars is its secret decision-making cabals! Perhaps it would help to change the name back to the River Quay.